We like our animal products. Well, you like your animal products. I’ve been a vegan for 28 years, so to be honest I don’t even remember what they taste like. To wit: Each year, the U.S. grows and kills about 10 billion livestock animals. 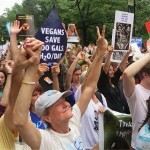 Globally, we’re raising and slaughtering about 56 billion animals animal agriculture each year. If you do the math, that means we’re killing 1,776 animals for food every second of every day. That doesn’t even include fish and other seafood. I know, that sounds like left wing hyperbole. 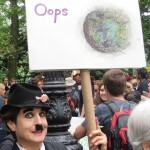 “It’s killing our planet!” But sometimes hyperbole isn’t hyperbole. Sometimes hyperbole is just the clear-eyed truth. I’ll start with climate change. The U.N. released a conservative report wherein they stated that animal agriculture causes about 18 percent of current greenhouse gas emissions. To put it in perspective: animal agriculture is responsible for producing more climate change gases than every car, boat, bus, truck, motorcycle and airplane on the planet. Combined. But we like our animals — or at least growing and eating them. 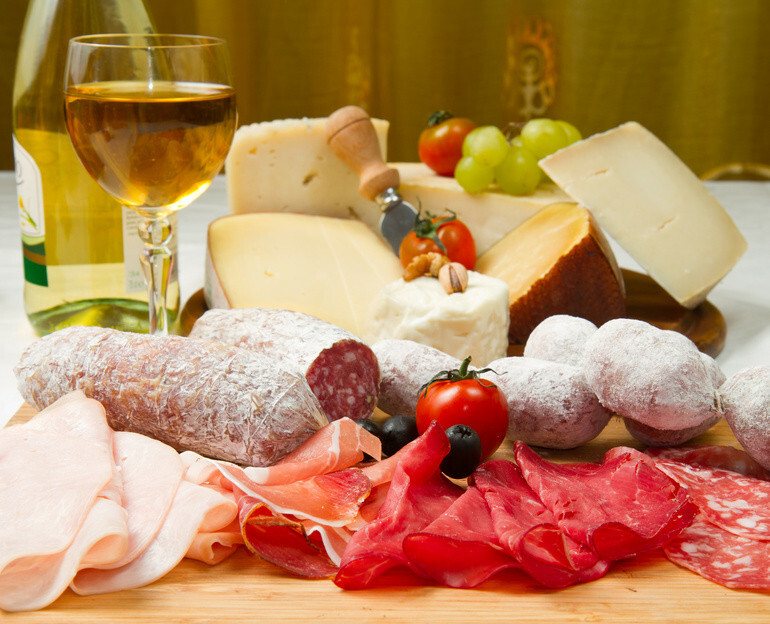 So we make the trade-off: animal products for climate change. Climate is complicated. And climate change is complicated. 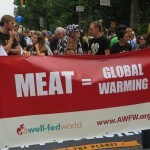 But the role of animal agriculture in climate change is simple. And how about famine? There are over 7,000,000,000 people on the planet, and many of them are very, very hungry. Article after article and book after book ask the question: “How will we feed a planet of 7 or 8 or 9 or 10 billion people?” The discussions turn to fertilizer and GMOs and arable land. But here’s a painfully simple idea: stop feeding human food to livestock. It takes around 15 pounds of grain to make one pound of beef – which can feed a couple people for a few hours. In comparison, 13 pounds of grain fed to humans directly can feed 13 people for most of the day. Globally, we don’t have a famine problem; we have a livestock problem. Feeding food to animals and then eating the animals is kind of like heating your house during the winter by burning wood outside. Speaking of winters: a few years ago, tired of cold winters in New York, I moved to California. Last year in L.A., we had around 362 beautiful days of sunshine. It was 80 degrees on Christmas, and there wasn’t a cloud in the sky. Which is great, apart from the fact that California and most of the West are now experiencing the worst drought in recorded history. As Californians, we’ve been asked to take shorter showers and use less water on our lawns. Both are good ideas. But let’s put it in perspective: a long shower uses around 40 gallons of water. 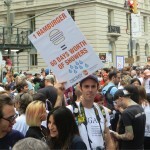 Whereas it takes 4,000 to 18,000 gallons of water to create a 1/3 lb hamburger. More than 90 percent of the water in California goes to agriculture. Some agriculture is very water responsible. It takes about 216 gallons of water to make one pound of soybeans, for example. But other agriculture is egregiously water intensive – including rice and cotton, but especially animal agriculture. Each pound of chicken requires about 500 gallons of water, and pork requires about 576 gallons of water. Personally, I’d like to make a deal with California. I’ll take much shorter showers if you stop subsidizing water use for livestock. If I just jumped in the shower and bathed quickly, I could even get it down to five gallons of water per shower. And after 132 showers, I would’ve used as much water as is needed to create one pound of beef. So we’ve established that having an estimated 56,000,000,000 livestock animals on the planet uses a lot of water and grain and creates a lot of methane and carbon dioxide. But these billions of animals also make waste. The really disgusting waste, not just invisible climate warming gases. Let’s put this in perspective: the good people of Philadelphia create roughly1,000,000 tons of urine and feces per year. And one, only one, large pig farm will produce roughly 1,600,000 tons of urine and feces per year. Our lakes and rivers are being fouled with algae blooms. Our groundwater is being polluted. And the main culprit is livestock.The 56 billion livestock animals on the planet are making tons and tons of feces and urine every year — three times as much as humans. And, in addition to fouling our water supplies, it’s also fouling our homes. A University of Arizona study found more residual feces and waste in the average omnivores kitchen than in their toilet bowl. Largely due to meat into the home. The animals spend their lives in their own feces and urine, and when they’re killed and packaged, they bring their feces and urine with them. Into your home. They also bring pesticides, antibiotics, growth hormones, cholesterol and saturated fat. To that end: if we collectively stopped eating animals and animal products tomorrow, studies suggest we’d see a drop in obesity, heart disease, diabetes and some cancers. We don’t have a global health epidemic; we have a global livestock epidemic. Toomuch of the western world health care budgets go to curing people of diseases caused by the consumption of animal products. And I’m not going to toot the vegan horn too much, but vegans have significantly lower rates of obesity, diabetes and some cancers. When I talk to people about animal agriculture and meat eating, people often say, “But meat is inexpensive.” And it is. But only because it’s so heavily subsidized by our tax dollars. In the United States, we spend billions of dollars every year in direct and indirect subsidies to the meat and dairy industries. Billions of dollars in our tax dollars, subsidizing a product that ruins our environment and decimates our health. We subsidize the grain that’s fed to livestock. We subsidize the water that’s used in livestock production. 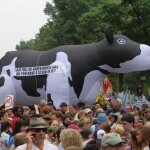 We, the taxpayers, subsidize animal agriculture. And what do we get? We get climate change gases. And we get trillions of pounds of animal waste that fouls our lakes and rivers and reservoirs. We get an end product that causes cancer, diabetes, heart disease and obesity. And, saving the best for last, we also get zoonotic diseases. “Zoonotic” is a fun and fancy sounding word. It sort of sounds like a very erudite part of a zoo, where the animals read books and live on boats. But zoonotic diseases are not fun or fancy. Some zoonotic diseases you might be familiar with: E.coli, Salmonella, SARS, Bird Flu, Ebola and even some old standards like smallpox and the common cold. Zoonotic diseases come from animals, and, in many cases, from animal agriculture. Luckily, thus far, we’ve been able to treat most zoonotic diseases with antibiotics. But here’s the rub: animals on factory farms are so sick, and in such bad shape, that antibiotics are all that’s keeping them from dying before they’re slaughtered. The animals are fed obscene amounts of antibiotics while they’re alive, and these antibiotics are then found in their milk and their eggs and their meat. When you’re eating an animal, you’re eating the fat and the muscle but you’re also eating all of the antibiotics the animal has been fed during its life. The double whammy of zoonotic diseases coming from animal agriculture: animals are the source of the zoonotic diseases but they’re also the source of antibiotic resistance. So the zoonotic diseases can kill us, especially as animal agriculture has created superbugs who don’t respond to conventional antibiotics. That’s the fun world of animal agriculture. And is heavily subsidized by our tax dollars. As a species, we are faced with complicated and seemingly intractable problems. And then we’re faced with animal agriculture. So rather than focus on the hard, intractable problems (like curing baldness) let’s simply focus on something easy with phenomenal benefit: ending animal agriculture. All we have to do is stop subsidizing it and stop buying animal products. Simple. And climate change gases are reduced by about 18 percent. Famine could end. Fresh water could become clean and more abundant. Deaths from cancer and heart disease and diabetes and obesity could be reduced. And zoonotic diseases could be largely reduced. We’ve done hard things in the past. We’ve ended slavery. We’ve given everyone the right to vote. We’ve passed legislation prohibiting children from working in factories. We’re even moving towards a time when cigarette smoking will be seen as a foul, distant memory. We can do this. We have to. Our reliance on animal agriculture is literally killing us and ruining our climate and our planet. 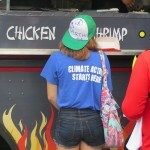 Wearing t-shirts with slogans like “Climate Justice Starts Here,” hundreds, if not thousands, of Climate March participants in NYC lined up at food trucks at the street fair after the parade to buy meat, fish and dairy products, demonstrating either a lack of awareness or disregard for what the United Nations says is, by far, the number one contributor of climate change and the planet’s biggest polluter, animal agriculture. How can the nation’s leading enviromental groups expect the general public to make eco-friendly choices if their own members engage in the most environmentally destructive activity — and if they themselves don’t promote a plant-based diet? Can we really expect world leaders at this week’s United Nations’ Climate Summit to take drastic measures to reverse climate change if “environmentalists” can’t take the most basic one? 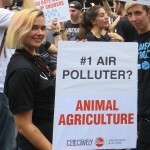 At Climate Change marches around the world, plant-based/vegan participants displayed compelling posters and distributed information about the impact of animal agriculture on the environment, and their efforts will assuredly effect some change. However, as evidenced in the groundbreaking documentary film Cowspiracy, animal agriculture must be eliminated altogether in order to reverse climate change and save the planet.